Oh, hi. It's just me - just talking about breakfast again. 85% of the time I have egg on toast for breakfast (in a variety of ways), but it seems I'm posting about the 15% of other things I'll have, like muesli. I used to be a granola girl; I made it every couple of weeks, though I always wanted it to have less sugar. But when you cut down the sweet stickiness that makes granola cluster, well, it's just not granola anymore. I've recently fallen back into muesli (I remember fondly the first time I had it, a $20 bowl in Oxford, England, but it was worth it - it is what I mimic and enjoy now each time) because it's lighter, softer, more complex and less sugary. And in warmer mornings (who am I kidding - I live in New England) I love to let it swim in lots of cold, cold soy milk. Here is a muesli org chart to tempt you past the jump. 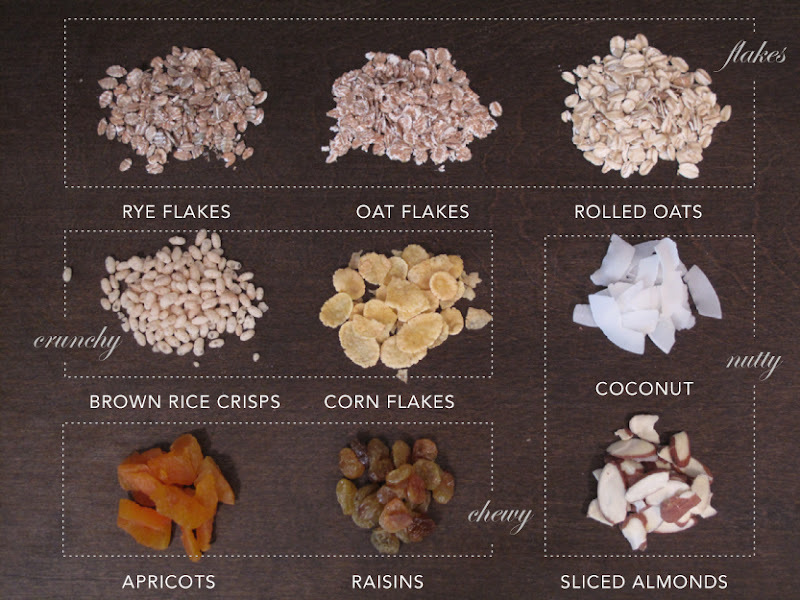 Muesli is essentially a mix of flakes/oats and fruit and nuts. Apparently it can be mixed with more than just milk - like juices and red wine. I eat it with milk and like cereal, but you can also let the milk soak over night and eat it like porridge. I'm willing to try it at least once this way and at least once with orange juice (just so you know). Like granola, and like awesome things, you can mix it up however you like. Above is my mix. A base of oats and flakes, some crunchy, some chewy and some nutty. I think muesli is easier to make than granola because you don't have to toast it if you don't want to, and you don't have to melt/combine/mix sugary, sticky things. Really, you could just mix ingredients and call it a day. But I do toast, a little. I toast the nuts, flakes and oats a smidgen. Just throw them on a tray into the oven at 300 and toast until golden like you'd like. I usually toast the coconut on a separate tray because it toasts much more quickly. I start with 2 cups of rolled oats and eyeball everything from there, but usually it's about 3/4 to 1 cup each flakes, nuts, fruit and crunchies. It yields a fair amount, much more than you get in the $6 boxed kind at the store. Sometimes I change it up mid-week and add more nuts or more dried fruit (figs!). I always have it with a scoop of plain yogurt, fresh fruit and milk. Crunchy, chewy, tart, creamy and sweet! Add some honey or agave if you prefer it sweeter. And that's it. Muesli. When I lived in Switzerland, we'd made muesli for dinner on a hot summer's day. Fresh fruit and/or berries, plain or fruited yogurt and maybe a splash of milk. Let it sit in the refrigerator and get cool and fluffy. (Almost all Swiss people eat it this way, maybe not the younger ones) It's the perfect summer's meal. Elena, I can't wait to try it like that this week!